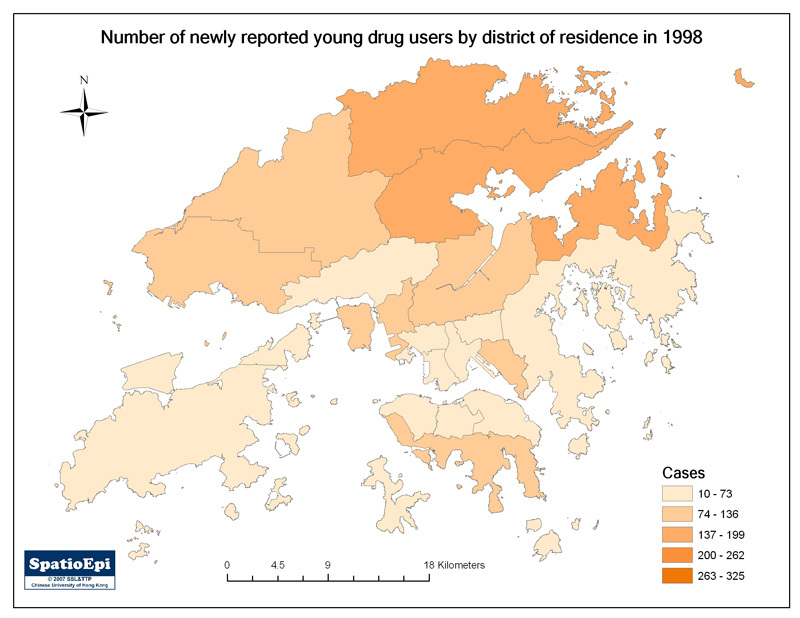 Around 6200 heroin users were reported in 2010 in Hong Kong. 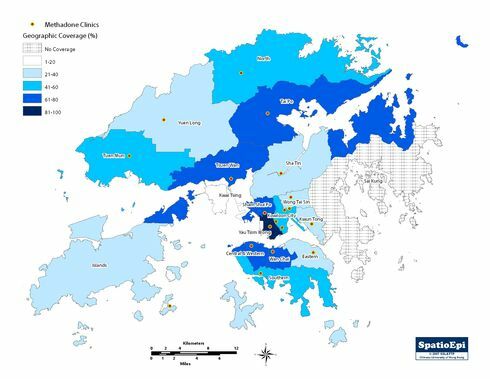 The map shows their distribution by district and the locations of their gathering places, the latter derived from a recent study. Clearly heroin users are not evenly distributed by their resident locations. Their mobility pattern have likewise varied. They tend to gather near the methadone clinics where they have access for substitution treatment. In a study in 2011, the gathering places were mapped by field workers with the help of volunteers familiar with the drug taking community. Some 70% of the gathering places are within 100m from the nearest methadone clinic. The estimated number of heroin users in each gathering place ranges from 100 to 400. 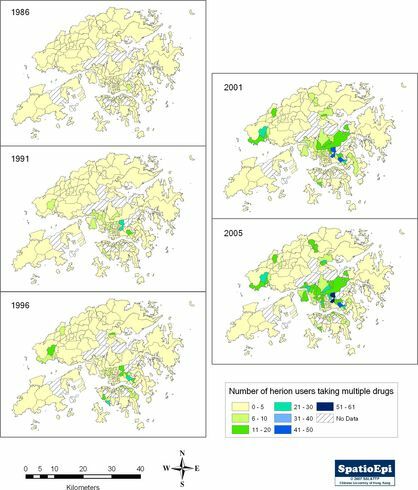 The age of heroin users in gathering places located in the urban areas, except Sham Shui Po, is higher, compared to rural places. Social networks have naturally been formed comprising heroin users sharing behavioural practice and also information. 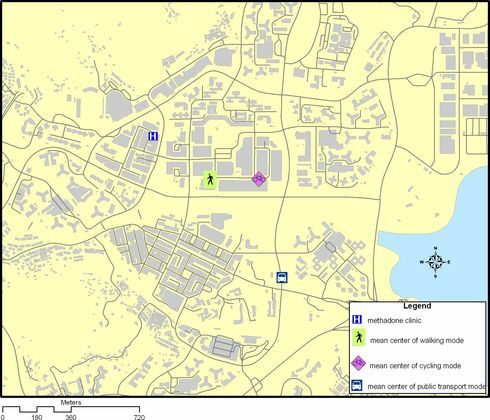 These gathering places provide an avenue for epidemiologic studies and the introduction of health promotion activities. 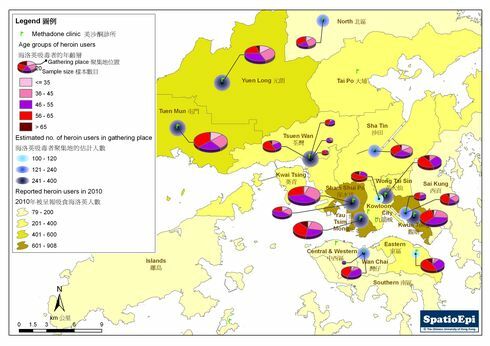 Data on gathering places were obtained from a study developed by Stanley Ho Centre for Emerging Infectious Diseases, The Chinese University of Hong Kong, while district level statistics were obtained from Central Registry of Drug Abuse Sixtieth Report, Narcotics Division, Security Bureau. Methadone can be used as analgesic, cough suppressant and anti-addictive maintenance in people who are on opioids. 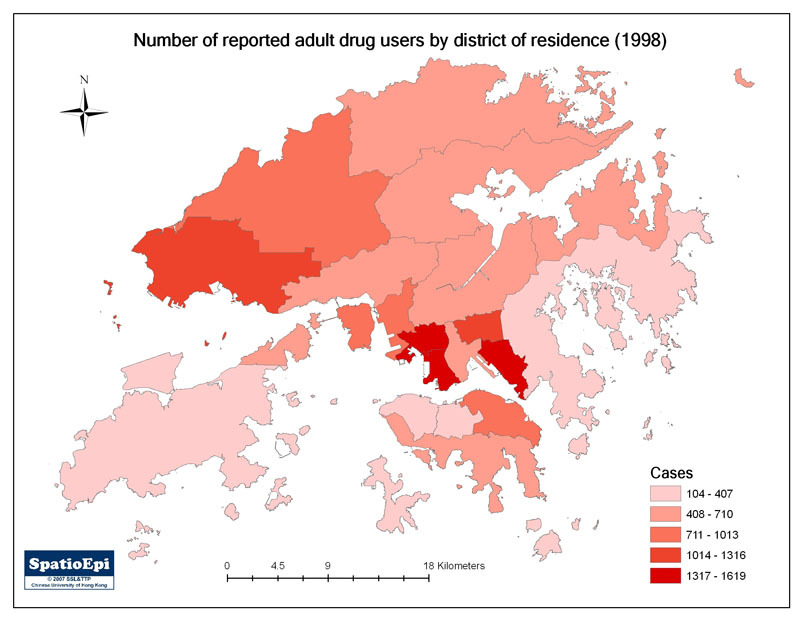 Back in the 1970s, in order to reduce drug dependence amongst heroin users, the Hong Kong Government established methadone maintenance programme and opened clinics to provide methadone to heroin users. Oral methadone has longer action (24 to 36 hours) as compared to heroin (6 to 8 hours). Its action is to occupy the brain receptor sites affected by heroin, thereby blocking the effects as well as relieving the craving and withdrawal symptoms. Methadone maintenance reduces unsafe needle sharing and potentially reduces blood borne infections. Methadone maintenance is a form of harm reduction measure, as it potentially reduces criminal offences associated with drug addiction and leads heroin users back to a normal life.